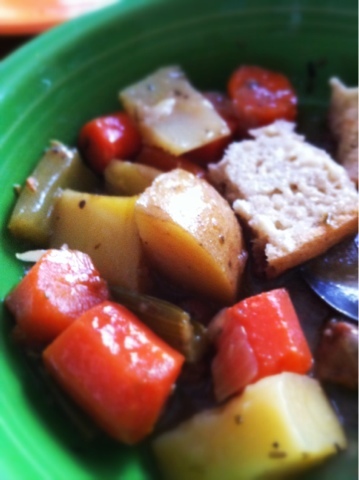 My husband prepared this comforting dish for a cool spring day. We enjoyed it served with homemade gluten free bread. In a ziplock bag, add beef, salt, pepper, and 2 Tblspn seasoned coating mix. Seal and shake to coat. Pour contents of ziplock into pan. Brown pasture raised beef on each side, then set aside. Sautée onions, garlic 1 Tbspn olive oil. Add spices, veggies, and cook 3 minutes. Add stock and remaining ingredients. Bring to boil. Reduce to simmer and cover until vegetables are tender.